BOOM! Studios is proud to announce THE SONS OF EL TOPO VOLUME ONE: CAIN, a hardcover original graphic novel from legendary filmmaker Alejandro Jodorowsky and virtuosic illustrator José Ladrönn, arriving in stores December 2018. This sequel to the 1970 Mexican Acid Western film written, scored, directed by and starring Alejandro Jodorowsky himself, tells the story of El Topo—a bandit without limits and a man with no moral compass. But when his journey through the arid west brought him face to face with a series of rogue outcasts, he found enlightenment in the unlikeliest place and was forever transformed, becoming a holy vessel imbued with the power to perform miracles. This was a journey that took him far from his first born son, Cain, and brought about the birth of Abel. Fueled by resentment, and unable to kill his saintly father, Cain begins the slow pursuit of his half-brother in a tale of magic and mayhem in THE SONS OF EL TOPO VOLUME ONE: CAIN, featuring a haunting cover by José Ladrönn, and continuing the mythic tale only in graphic novel format. “THE SONS OF EL TOPO VOLUME ONE: CAIN continues the surrealist western story you know from the film, digging deeper into the philosophical and spiritual questions of El Topo’s journey – along with the incredible visual experience you’d expect from master artist like Ladrönn,” said Sierra Hahn, Senior Editor, BOOM! Studios. THE SONS OF EL TOPO VOLUME ONE: CAIN is the latest release from BOOM! Studios’ ambitious Archaia imprint, home to graphic novels such as Mouse Guardby David Petersen; Rust by Royden Lepp; Bolivar by Sean Rubin; Jane by Aline Brosh McKenna and Ramón K. Pérez; and licensed series like Jim Henson’s Fraggle Rock and Jim Henson’s Labyrinth: Coronation. 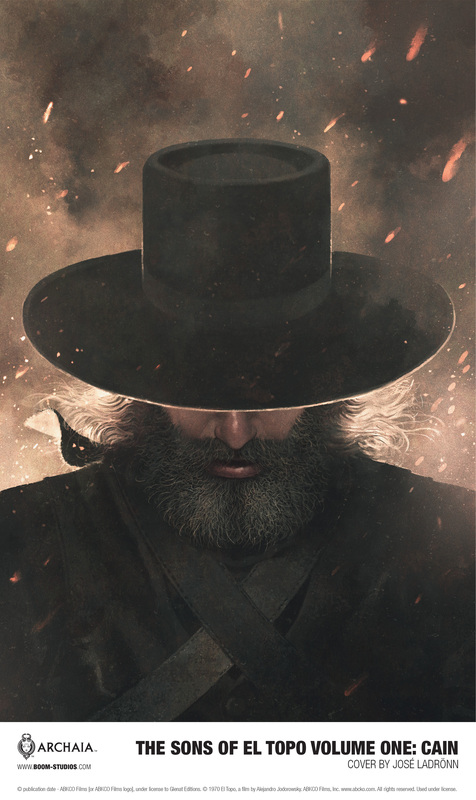 Print copies of THE SONS OF EL TOPO VOLUME ONE: CAIN will be available for sale in December 2018 at local comic book shops (use comicshoplocator.com to find the nearest one), at bookstores or at the BOOM! Studios webstore. Digital copies can be purchased from content providers, including comiXology, iBooks, Google Play, and the BOOM! Studios app. For continuing news on THE SONS OF EL TOPO and more from BOOM! Studios, stay tuned to www.boom-studios.com and follow @boomstudios on Twitter.